Published on 25 July 2017 by Benjamin Marias . Footwear recycling is now a reality in Europe. Together with the Dr. Mike Lee and the financial support the SOEX Group and Eco-TLC, AIR is proud to have contributed to the development of the first fully automated recycling line for any kind of shoe waste. Next steps : going at the industrial scale ! The annual worldwide consumption of footwear is currently projected to be in excess of 20 billion pairs. In France alone, around 415 millions of pairs of shoes are bought each year (Eco TLC 2012). It is estimated that less than 5% of end-of-life shoes are being reused or recycled, with most being disposed of directly to landfill sites. Footwear products are a complex product with over 40 different types of materials being used to produce them. This makes material recycling an extremely challenging problem and subsequently no ideal solution yet exists. A number of technical possibilities do however exist. For example, the Nike Grind process for sports shoes and the work at Loughborough University. 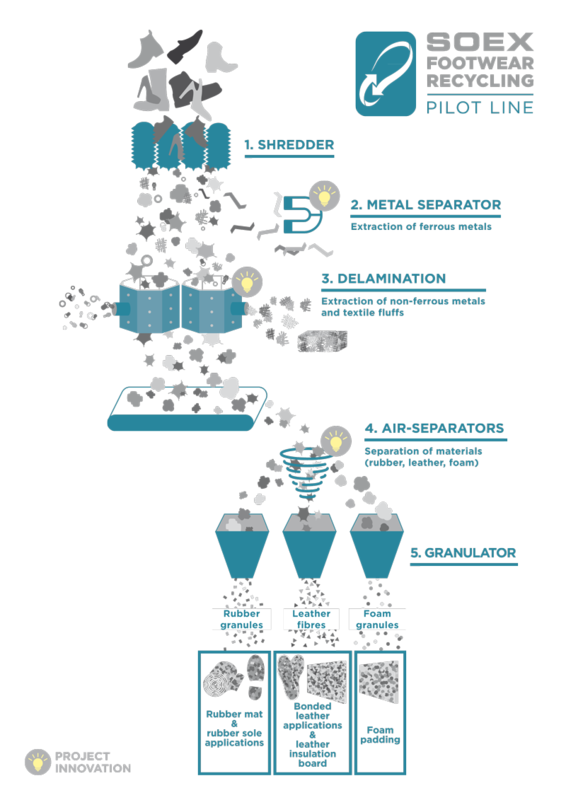 These processes have provided a clear possibility for the recovery of rubber, leather, foams and textiles from footwear waste. However, there are still some questions surrounding the large-scale commercial viability of these processes. To date only limited low-value applications for recovered footwear materials have been found (largely due to unknown economic and technical viability of creating high-value applications) and so it is difficult to justify investment in costly recycling process technologies. Secondly, there are some questions regarding the technology. In particular it is difficult to recover high purity leather and rubber from shoes. To implement a circular economy approach into the footwear industry. Recycling shoe waste started as an idea 4 years ago when we carried out the first feasibility study through a R&D project already supported by Eco-TLC. Following the success of the prototype, we started a new R&D project in 2014 with the goal to recycle larger volume of shoe waste while improve the efficiency of the recycling line and increase the purity of the recycled materials. Eventually, demonstrate the possibility to use those recycled materials into high value applications (footwear, flooring, furniture, etc.). 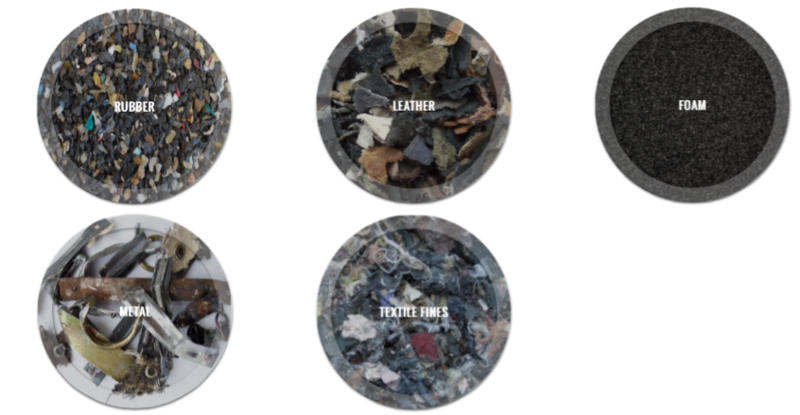 The SOEX Footwear recycling line is based on a mechanical recycling process. No chemical involved. The true innovation lies on one side on the complementary of the different machines and on the other side on specific development made by Dr. Mike Lee ; the Delaminator and the Air-Separators. The Rubber: After being pulverized, rubber powder can be reintegrated into new footwear outsole. Tests to find the right percentage have been carried out with several rubber outsole manufactures. Partnerships with brands are now being discussed for large scale production. The Foam: After being fine grinded, foam granules can be reintegrated into new flooring surfaces as Nike is doing with the Nike Grind. New tests are running to integrate the reclaimed foam into new midsole or innersole. The leather: Many tests have been carried out to find the best applications for the leather like sound insulation walls. However, the value added is still too low. So new tests are currently being done to make thin leather panel for the flooring industry. With the current pilot line, we are able to recycle around 1 ton of shoe waste per day. It seems to be a lot but compare to the annual volume of shoes going still to incineration or even worst to landfill, it’s too little. So, our goal is now to scale up the line. For that purpose, big investments are needed and negotiation are now starting. Stay tuned !